Pirates of the Caribbean- Dead Man's Chest. Aye matey. Take a pirates journey into the world of Captain Jack Sparrow. 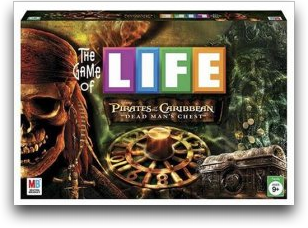 Join him in a life and death adventure against the one and only Davy Jones. Choose a character to be captain of your ship as you sail the high seas. Aye! You'll need a mascot too. Sail along visiting ports, raiding ships, fighting off cannonballs and collecting loot while avoiding Davy Jones and his Kraken. When you reach Isla Cruces, kick back and enjoy some grog while you wait for other to join you. The pirate with the most treasure at the end of the game wins.